This weekend, its supposed to get up to almost 50 degrees here! And in just about a month we'll be changing our clocks again. It feels like spring is right around the corner- Isnt it just amazing? And when I think of spring, I can hear my friends all saying "Come on, you should get out more... just look how nice it is outside. Lets get ice cream, or something." So I'll look outside, and say something like "Oh, wow! It really is nice. You know, I dont think I can go today.... this is perfect weather to sit on the porch and read." Before I forget, I updated the Books tab on my website part. Now you can see covers and how to go about purchasing them from Amazon... Click here for that page. 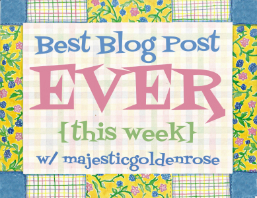 Got to go but I do have a new weekly linky feature that I think you will enjoy. Link up any post that fits into the awesome, recent, and wholesome categories. Spend a moment to comment on a post or two before you and subscribe so you can come back next week! I'm going to be honest here: Sometimes, I look at the little kids at church and see brats. Little girls that whine and cry and little boys with who knows what on their hands.... I think that it would be so much better to steer clear, and let someone else do the teaching... and thats what I've become comfortable doing. But lets face it: Matthew states "But Jesus said, Suffer little children, and forbid them not, to come unto me: for of such is the kingdom of heaven." See, those kids are part of the church, too, even if they dont know it yet. They need to be brought up in a godly way, and we, as their elders, each have to be the ones to guide them. After all, these little kids, they are our future. So I challenge you to get involved, in one way of another, if you aren't already.... and comment about it if you get the chance, of course! Well, I have a few kid-jokes to make you smile and then a video, alright? It didn't have the guts! Anyone have any other jokes they want to share? **First of all, I received this book from the Blogging For Books program, and can recommend it for other bloggers. But about the book itself, Ten Days Without by Daniel Ryan Day: I'd rate it a 3 out of 5. A Rebellion against Apathy.A Strategy for Action. “Life is full of good intentions, but for too many, our good intentions never become good actions—they don’t move us forward, draw us closer to God, or make a difference in the world. Daniel Day could tell you all about his love for God and his desire to live as a follower of Jesus. But it took a simple but radical experiment to move from simply talking about it to actually living like it. For ten days at a time, Daniel chose to abandon a certain “necessity”—a coat, a voice, shoes, media, furniture, legs, touch—and to blog about it to raise funds and awareness for organizations that are doing amazing things to make a difference in the world. And then he invited others to join him in the experiments and spread the vision. Together they served God and others—and experienced significant personal change in the process. Ten Days Without is the story of their life-altering adventure. Ten Days Without is a compelling story and practical guide that will equip you and your friends to break through walls of convenience and indifference, and join a movement that is confronting apathy and ignorance around the world to make an impact on people’s lives in a God-honoring way. Ten Days Without is where our good intentions end and making a difference in the world begins. and human touch (to address orphans, widows, prisoners, and other untouchables). I agree that giving up things like media can be beneficial in our world, but I fail to see how ten days is enough- from the book I felt that this all wasnt about having an eternal relationship with God, but instead spending a week and a half drawing attention to yourself to get a few likes on your status... because it seemed that the entire thing was a marketing game to go without said item and promote the book even more. I want it to be clear that in the end, the book does have several good points such as raising funds to help the needy. I can recommend it, specifically to a new-believer and if you are interested, you can read a sample of the book here as well as purchase the book from Amazon in both Paperback and the Kindle Edition.